Victorian dairy farmers, Rhonda and Marcus Ellis have been able to reduce the incidence of milk fever by feeding their pre-calving cows with Optimilk pre-calving pellets from Rivalea Australia . Rhonda Ellis runs the dairy farm operation with her husband of 51 years, Marcus and her twin sons, Todd and Shaun. 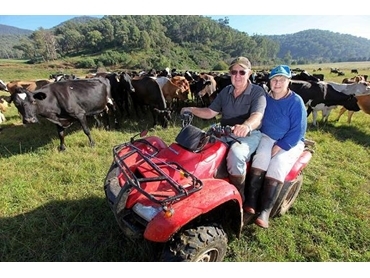 The family’s 400-acre Tallandoon property, Milbrook supports 410 cows and 16 bulls. Poddy calves and other young stock are raised on a nearby leased property where the family also makes hay if the season is right. The dairy farm milks 380 Jersey-Friesian cross cows with varying production levels but peaks at around 28 to 30 litres per cow, according to Rhonda. Milk fever used to be a big problem at calving time and the economic impact was significant as there were extra costs involved in treating them without milk production during the period. Milk fever occurs when the cow’s body allows massive amounts of calcium to drain from the blood into the colostrum and milk at calving, depriving the cow of her own much-needed calcium. Other consequences of milk fever include poor muscle contraction leading to difficult and delayed calving, retained foetal membranes and metritis. These conditions can depress feed intake and reduce production in addition to interfering with fertility, according to South Australian animal nutritionist, Tony Edwards of ACE Livestock Consulting. Tony recommends lead feeding, also known as transition feeding as the nutrition strategy to avoid milk fever, which involves the provision of a transition diet to promote the utilisation of calcium. Rhonda feeds the pre-calving cows hay and keeps them away from lush pasture and on dry ground in addition to feeding them Rivalea Optimilk pre-calving pellets. Rhonda buys Optimilk pre-calving pellets in bulk and stores the pellets in a separate silo with a self-feeder, which is far more cost-effective and convenient than buying in bags. Rivalea Territory Manager, Stephen Blain recommends feeding each cow two to three kilograms of the pre-calving pellets for 14 to 21 days before calving so that they get optimum levels of nutrients and minerals. Using the pre-calving pellets serves two purposes for the Milbrook cows: reducing the incidence of milk fever and getting them accustomed to eating the other Optimilk diets. Rhonda comments that they have noticed a significant drop in the number of milk fever cases since they began feeding the cows the specialised Optimilk pre-calving diets. In addition to saving them money in terms of treatment costs and lost production, the dairy is also able to save on the extra time involved in treating sick animals.